Dr. Virtue teaches us how to use our sixth sense so we can lay our hearts open to the possibility of healing. Begin a dialogue with the angels and you can achieve, in a practical way, the fulfilling life you want and deserve. 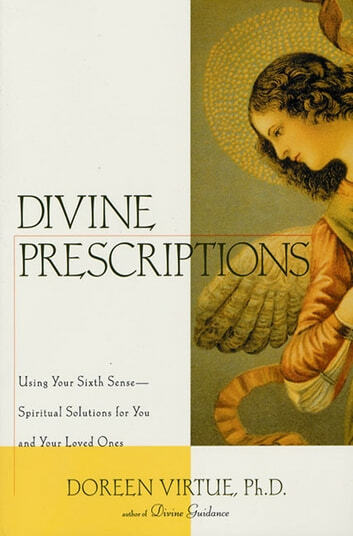 In Divine Prescriptions, bestselling author Dr. Doreen Virtue illuminates the ways all of us can receive healing messages from God and the guardian angels when we need guidance. The angels will speak to us about health, family, relationships, finances, and careers, and Divine Prescriptions proves that fact citing case studies, angel readings, and transcripts from Dr. Virtue's angel therapy sessions. When the problems we face are too complex to be solved by counselors, friends, or even Dear Abby, Dr. Virtue shows us another way-a divine way-to discover answers. 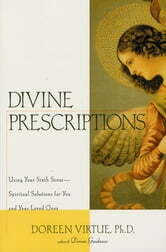 Divine Prescriptions also explains how and why God and our guardian angels use us as messengers to give advice and consolation to others. She explains how to distinguish between normal conversations and key messages from the angels (who are constantly around us) and provides step-by-step instructions for performing angel readings. Dr. Virtue's universe is benign, the angels around us mean us well, and once we are able to receive their vitally important communications our goals and those of the people we love will become attainable.